North Cornwall is one of Britain’s most beautiful areas, with numerous beaches, rocky coves and spectacular cliffs, and the South West Coastal Path connects them all. 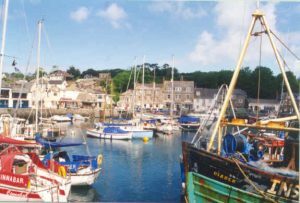 Garden Cottage Holiday Flats are also within easy reach of Padstow and Wadebridge, both with excellent tourist facilities. The coastal footpath is on the doorstep, with wonderful walks and views up and down the coast. The Camel Trail can be enjoyed by cyclists, walkers and bird watchers. The trail starts at Padstow and follows the old railway line by the Camel River Estuary to Wadebridge, Bodmin and Wenford Bridge. The Saints Way also starts at Padstow, crossing Cornwall north-south to Fowey. Trevose Golf Course is also on your doorstep, with an 18 hole championship course, a 9 hole and a short 9 hole course. The club house includes tennis courts, a swimming pool, and a restaurant. We have so many beautiful beaches that we gave them their own [page]. You can have lessons and hire wetsuits from Constantine surf store. 1 1/2 miles by road or foot. Has a garage, 2 food shops and 2 pubs. Several restaurants including Rafferty’s Cafe and Wine Bar, The Olive Tree, The View and The Cornish Arms, which is now run by Rick Stein. Lovely small fishing port made famous by Rick Stein, but which still manages to retain its charm, with narrow streets and boats in the harbour. On the outskirts of Padstow there is a small Tesco, and a farm shop at Crugmeer. There are many other small shops around the harbour. Restaurants include of course the Seafood Restaurant, St Petroc’s Bistro, Middle Street Cafe, No 6, Prawn on the Lawn, to name but a few.